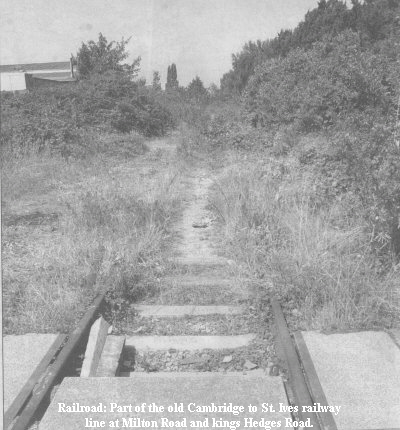 WHY is it I get the strangest feeling that a particular council has gone into panic mode over an organisation called Cast.Iron who want to get the railway line from Cambridge to St Ives up and running again? This is a much better idea than any very costly guided bus system would be. The guided bus system would also be expensive to maintain. A heavy railway system and even a light railway system is far more logical than any guided bus system would ever be because there is already a railway track laid down which needs some attention but not too much. It would not be expensive to put back into service and it would be a worthwhile service to the public in the area with reasonable fares. Cast.lron is totally correct to want the Cambridge to St Ives line back in total service. It would take about three years to get a full service running and funded by the people, either paid or as volunteers, and an example of something very similar is the Nene Valley Railway. Although into preservation, they do run a type of service which the public and members are using and Cast.Iron can do the same with just a few moderate changes and provide a good service and system where any profit made will go back into running and improving services and rolling stock to the true benefit of the people who live in and around Cambridge and Cambridgeshire. It is interesting to see how so many local councils and councillors, Government departments and MPs never take the responsibility for their blunders these days but pass the buck to someone else to take the blame. I for one will see to it that if the guided bus goes ahead and loses public money 1 shall make a point of holding those who push the scheme through against the people's wishes totally responsible for wasting taxpayers' money.